The first thing I want to say is I am a huge admirer of HUL. It’s not a CEO factory for nothing. It’s people practices are far superior to many global HR organisations. We Indians have grown up using HLL products and call it by any name, HLL or HUL, it’s a great organisation. And precisely because it’s a great organisation, am hoping that they will work on my proposal. 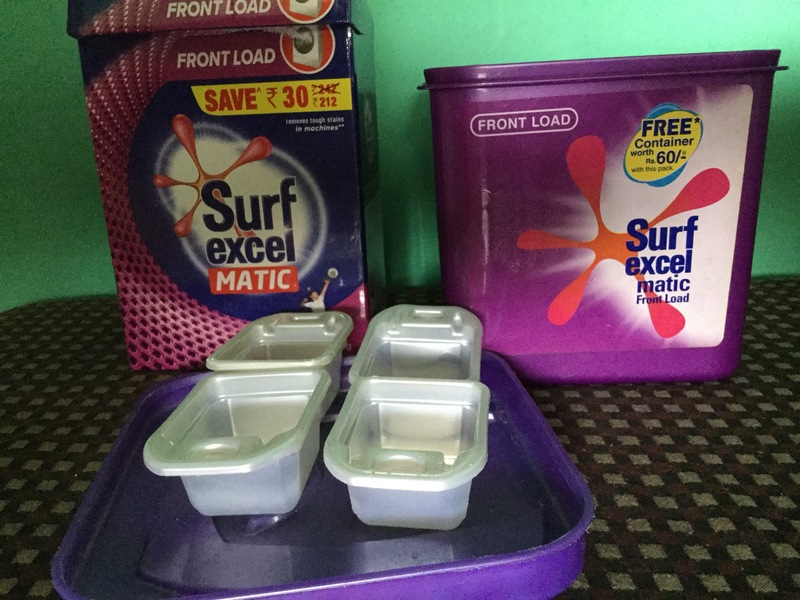 It’s the best selling detergent brand – Surf. It has taken several avatars with the changing times and changing models of washing machines. From the “samajdhar” Lalitaji to the “daag acche hain” campaigns, the Surf brand and HUL have just gotten stronger. I have a front loading washing machine and I always buy Surf Excelmatic. BUT, I have a huge problem with the picture above. Can you guess ? Every packet of Surf Excel comes with a measuring cup… I have 15 of them left after giving away several. The packaging is plastic, then every packet has a plastic measuring cup, then it’s placed inside a corrugated paper box many times and then HUL speaks of SUSTAINABILITY ! There lies my problem. Not just with HUL but P&G and all other FMCG product manufacturers. Am not even starting off on the cola companies – because their very business depends on PET bottles, and turning nourishing water into a sugar-infused-toilet-cleaning solution called cola that doesn’t do an iota of good. Talking to them is like requesting them to commit suicide. 1. Let people buy their own measuring cup. 2. Provide a wooden or steel measuring cup at an extra cost, so those who need it can buy it. If they have one already, they just use that. 3. Washing Powder dispensing machines in all departmental stores. Customers can bring their old containers and buy at a discounted price. 4. If there is plastic packaging, then no corrugated box packing…. why waste trees and the Earth in one go ? 5. Larger sized packs and discounts to make them attractive… not 1kg packs bundled together, but a 5kg pack. 6. Don’t give plastic containers free like in the picture above…. this is at least 5 years old and I am never buying another container for storing the washing powder. 7. Make all the washing powders less foamy so that water consumption is lessened. 8. To mop up all the plastic measuring cups out there…just pay one rupee or five rupees to get it back and recycle it safely. No one hopefully uses these containers or measuring cups in a microwave! Think of all your products and of ways to reduce your plastic footprint. You have some of the best minds working for you.. am sure they will find a 100 different ways of packaging your products in sustainable ways. Am thinking, why can’t we get a rupee back for every shampoo plastic bottle that we return? Think about it. Happy Vijaya Dashmi HUL…. please free the world from the menace of plastic. It’s truly the demon destroying Mother Earth.